While I will share with you a beautiful mythological story, the deeper significance and intended outcomes you can experience from this tale will also be shared. The Gods and Goddesses of Indian “Mythology” are symbols of states of consciousness. Usually states of higher and expanded consciousness which are told in a legendary format. The sequence of the story (legend) triggers a “eureka” experience. This connects oneself with the larger universe, usually experienced in an abstract fashion. Myth is the story in the collective imagination that explains the infinite mystery of our existence. It is told that as a child, Hanuman rose to the skies to catch the sun, thinking that it was a bright and delicious fruit, and wanted to eat it. He rose up to the skies in the direction of the sun to grab that substance and swallow it. 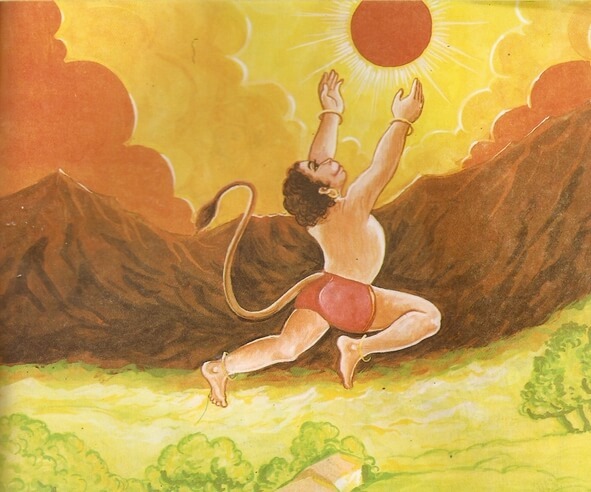 Indra, the ruler of the heavens, was startled at this adventure of a mortal trying to ascend to the heavens and grab the solar orb, so he gave such a blow on the chin of this little boy with his weapon called Vajra (disc) and Hanuman fell down unconscious. Hanuman’s father, Vayu (wind god) got annoyed at this. Not just our physical prana but the prana of our mind and all the vibratory forces in the universe. Vayu manifests as technological information (data, calculations, communications), light, or electrical force. Cosmic Vayu links us to the cosmic mind that aligns all minds together in an interconnected network of thought. 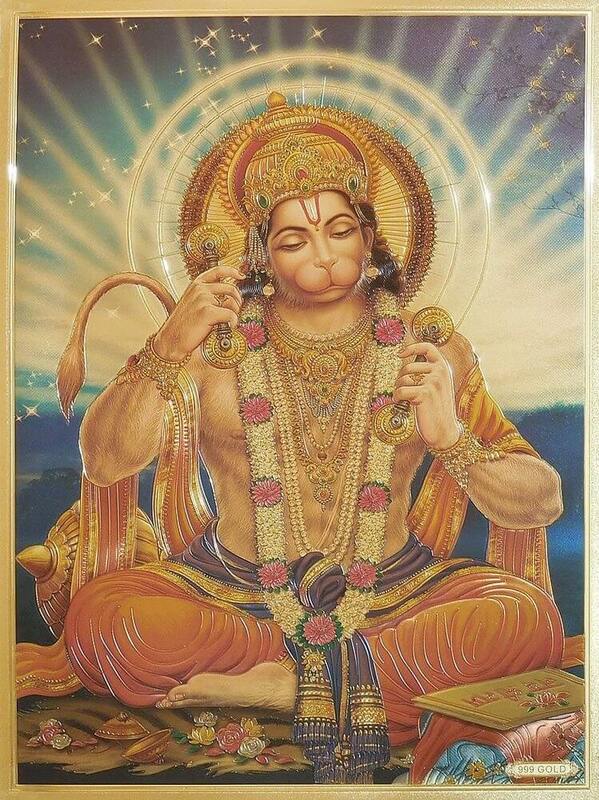 Hanuman is the most wise and observant. A master who decisively discriminates between the intellect (buddhi) and the inner intelligence (purusha) to reveal the highest truth. This prana manifests when you connect to the unlimited potentials within us. Cosmic Vayu gives flexibility of body, unbounded vitality, stout-hearted will power, motivation and dynamic mind capacity. Tapping into Hanuman consciousness grants certain yoga siddhis (dormant non-local potentials of perfected human-capabilities that exist in every consciousness). Capabilities like movement, extraordinary perceptivity and mastery of the senses and cosmic energies. Our highest prana merges with immortal Prana. Dedicate ourselves as Hanuman to Rama, to offer our mortality or temporal existence to the immortal and infinite. Vayu governs the creation and equilibrium of nature and the universe as a whole. As the wind blows, so the clouds move and rain. Vayu moves the sun and moon, which govern the earth through gravity. Cosmic Vayu actually creates galaxies (through smoke clouds). Hanuman is the conduit of the power of Rama: universal Self who orchestrates all nature. This is true bhakti (devotion). Self-power (Atma Shakti) to realise our higher potential and accomplish what is supernatural and transformational. Fearlessness, self-confidence, daring and boldness to attempt the impossible and succeed. Established in the field of transcendence, then we can playfully interact with all the energies across the vast layers of the universe. 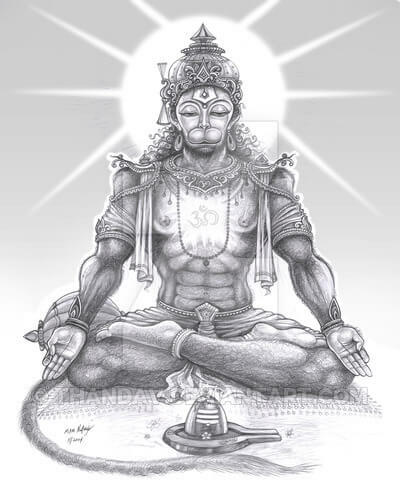 Access your deeper cosmic energy and Become Hanuman. Bibliography: American Institute of Vedic Studies, David Frawley. other art: unknown, but thank you. Do You Really Think The Sun Causes Skin Cancer?